With the season beginning to wind down it seems that in some respects there are still more questions than answers regarding the final Premier League table. There are still valuable positions up for grabs including which teams will finish third and fourth, which of Sunderland or Newcastle will be relegated (or both? ), and whether or not Leicester will be able to hold on and win the Premier League title. At this point in the season the title is Leicester City’s to win, or lose for that matter. With three matches remaining they need just one win to seal it. With three matches remaining they currently hold a seven point lead over Tottenham Hotspur and three points would be enough to see the Premier League title head to just the sixth ever team to win the coveted title. The bottom of the table is a three team debacle for which two teams will go down. Norwich and Sunderland both have played 34 games to Newcastle’s 35 giving them an advantage while they also both have 31 points compared to 30 for Newcastle. It should be an intriguing finish to the season for whichever two teams are ultimately relegated. Despite Manchester United’s best efforts to not finish fourth or higher this season, they are somehow only five points behind both Man City in third and Arsenal in fourth and with a game in hand having played 34. With Man City focusing on Champions League this could be a chance for United to gain some ground. West Ham could still push all three of these teams, but recent draws (four in their last five matches) have left them three points behind Manchester United when they could have been level at the very least. Week 36 does not have any double games for any teams, but week 37 does for Chelsea, Everton, Liverpool, Manchester United, Norwich, Sunderland, Watford, and West Ham. The interesting thing is that a majority of these teams have plenty to play for, with perhaps Everton being the exception. While four weeks ago everyone was talking up Everton as the premier stack to set up, they are now looked on as a team in decline. Watford is perhaps the one other team in this list that have been decline and should be avoided. The current form table places them fourth from bottom with Everton third from bottom. Only West Brom and Aston Villa have been playing worse than these two. 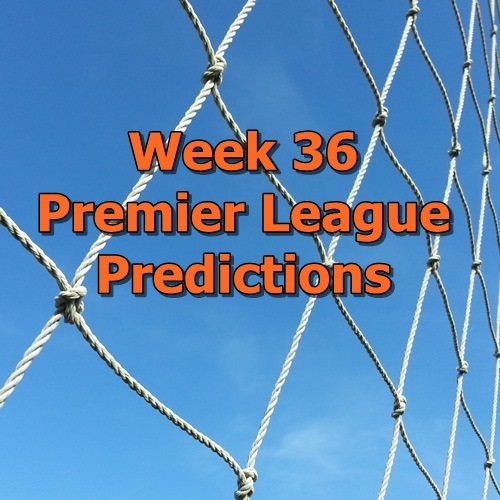 In setting up your week 36 team it is time to look ahead to week 37 and even 38. Fantasy Football 247 has an excellent fantasy football fixture tracker that I highly recommend to help keep up with who is playing and which team they are playing against. This week is a good time to start setting up your team and preparing for the double game week. I would advocate picking players from West Ham and Sunderland. Both have relatively favorable matchups and have plenty to play for. While I would also recommend Liverpool players considering their scoring form, the problem is Klopp’s recent rotation that makes it difficult to predict which players will be starting. No matter how you decide to use these predictions, I do hope they can give you some insight into how this weekend’s matches could go. Regardless of my predictions it should be yet another excellent weekend of soccer and hopefully you are all able to enjoy it! Good luck and have fun! I hope Leicester will have it in them to win at Old Trafford. Good luck, Foxes!